Azure 리소스에 대한 액세스를 관리하려면 적절한 관리자 역할이 있어야 합니다.To manage access to Azure resources, you must have the appropriate administrator role. Azure에는 선택할 수 있는 몇 가지 기본 제공 역할이 있는 RBAC(역할 기반 액세스 제어)라는 인증 시스템이 있습니다.Azure has an authorization system called role-based access control (RBAC) with several built-in roles you can choose from. 이러한 역할은 관리 그룹, 구독 또는 리소스 그룹과 같은 다른 범위에서 할당할 수 있습니다.You can assign these roles at different scopes, such as management group, subscription, or resource group. RBAC를 사용하여 리소스에 대한 액세스를 관리하는 것이 좋습니다.Microsoft recommends that you manage access to resources using RBAC. 그러나 여전히 클래식 배포 모델을 사용 중이고, Azure 서비스 관리 PowerShell 모듈을 사용하여 클래식 리소스를 관리하는 경우에는 클래식 관리자를 사용해야 합니다.However, if you are still using the classic deployment model and managing the classic resources by using Azure Service Management PowerShell Module, you'll need to use a classic administrator. Azure Portal을 통해서만 클래식 리소스를 관리하는 경우 클래식 관리자를 사용할 필요가 없습니다.If you only use the Azure portal to manage the classic resources, you won’t need to use the classic administrator. 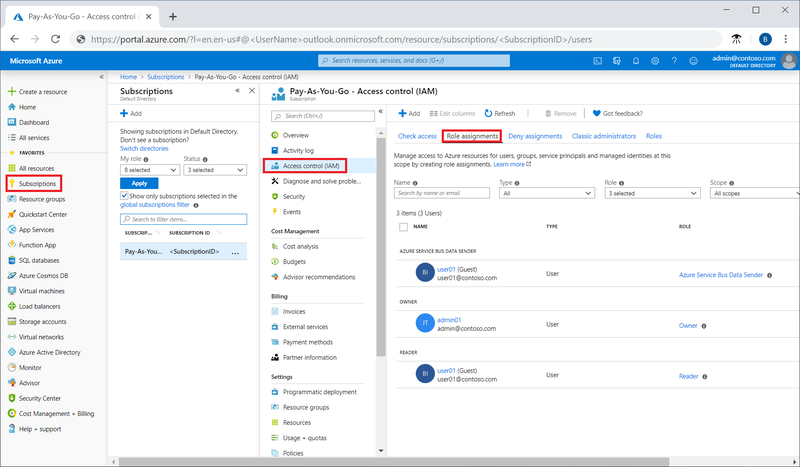 자세한 내용은 Azure Resource Manager 및 클래식 배포 및 Azure 클래식 구독 관리자를 참조하세요.For more information, see Azure Resource Manager vs. classic deployment and Azure classic subscription administrators. 이 문서에서는 구독 범위에서 RBAC를 사용하여 사용자에 대한 관리자 역할을 추가하거나 변경하는 방법을 설명합니다.This article describes how add or change the administrator role for a user using RBAC at the subscription scope. 특정 사용자를 Azure 구독의 관리자로 지정하려면 해당 사용자에게 구독 범위에서 소유자 역할(RBAC 역할)을 할당합니다.To make a user an administrator of an Azure subscription, assign them the Owner role (an RBAC role) at the subscription scope. 소유자 역할을 할당하면 다른 사용자에게 액세스를 위임할 수 있는 권한을 비롯한 구독의 리소스에 대한 모든 권한이 사용자에게 제공됩니다.The Owner role gives the user full access to all resources in the subscription, including the right to delegate access to others. 이러한 단계는 다른 역할 할당과 동일합니다.These steps are the same as any other role assignment. Azure Portal에서 구독을 엽니다.In the Azure portal, open Subscriptions. 액세스 권한을 부여하려는 구독을 클릭합니다.Click the subscription where you want to grant access. 액세스 제어(IAM) 를 클릭합니다.Click Access control (IAM). 역할 할당 탭을 클릭하여 이 구독의 모든 역할 할당을 봅니다.Click the Role assignments tab to view all the role assignments for this subscription. 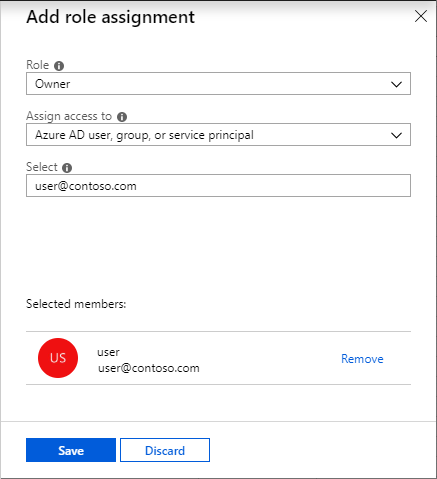 추가 > 역할 할당 추가를 클릭하여 역할 할당 추가 창을 엽니다.Click Add > Add role assignment to open the Add role assignment pane. 역할을 할당할 수 있는 권한이 없으면 옵션이 비활성화됩니다.If you don't have permissions to assign roles, the option will be disabled. 역할 드롭다운 목록에서 소유자 역할을 선택합니다.In the Role drop-down list, select the Owner role. 선택 목록에서 사용자를 선택합니다.In the Select list, select a user. 목록에 사용자가 표시되지 않으면 선택 상자에 직접 입력하여 표시 이름 및 이메일 주소에 대한 디렉터리를 검색할 수 있습니다.If you don't see the user in the list, you can type in the Select box to search the directory for display names and email addresses. 저장을 클릭하여 역할을 할당합니다.Click Save to assign the role. 몇 분이 지나면 사용자에게는 구독 범위의 소유자 역할이 할당됩니다.After a few moments, the user is assigned the Owner role at the subscription scope. RBAC(역할 기반 액세스 제어)란?What is role-based access control (RBAC)? 다른 도움이 필요한 경우 지원에 문의하여 문제를 신속하게 해결하세요.If you still need help, contact support to get your issue resolved quickly.